There's much more progress to report this month. The frame stretcher which also supports the brake cylinder has been fabricated by Dave Hewson, who made the driver's pedestal. Delivery to Bridgnorth is expected shortly. 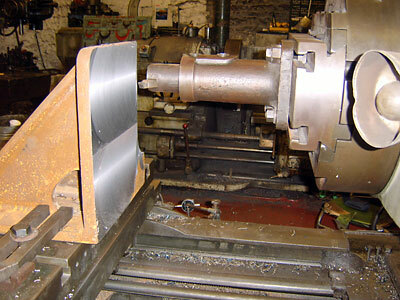 Steel is being cut for horizontal stretchers, stretcher & front radial arm support, stretcher & hind radial arm support. These items will have the flanges bent to shape at Accurate Section Benders Ltd. in Kingswinford before arriving at Bridgnorth for their fabrication to be completed. All these items will require some machining of the faces that fit to the inner faces of the main frame plates. Various items of steel are being prepared for stiffening the inner faces of the buffer beams and for forming the dragboxes. Member John Tidmarsh has collected the whistle from a BR Standard Class 2 2-6-2 tank (84XXX), donated by a gentleman from Nottingham who visited our stand at Barrow Hill last August. The whistle is of the same type as that fitted to the 82XXX class. To the left are pictures of the completed patterns and coreboxes for Leading and Trailing Axlebox Guides to drawing SL/SW 28. 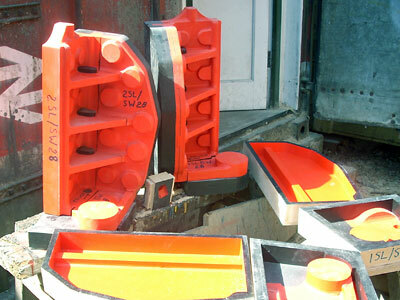 Castings produced from these patterns will carry the manganese steel liners within which the driven axleboxes ride up and down. Each main pattern consists of four pieces that are dovetailed together. These dovetails are arranged to release easily thus enabling the undercuts on the pattern to be readily removed from the moulding sand. The very small corebox located between the two main pattern pieces is used to create cores common to both 1SL/SW 28 and 2SL/SW 28. Readers might be interested to know the BR Std 3 was to have Axlebox Guides and Hornblocks identical to the Ivatt Class 4. Before production commenced there was a design change from oil to grease lubrication of the horn assemblies. To accommodate this change the patterns, and hence the castings, were slightly modified. 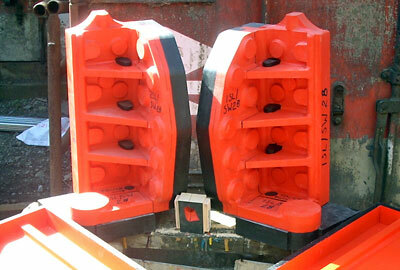 This casting modification did not compromise its usefulness for use on oil lubricated horns. As a result the horn patterns now being produced are equally suitable for use on Ivatt Class 4, BR Std 3 (82XXX & 77XXX) and BR Std 4 2-6-0 (76XXX) locomotives. Should there ever be a need to fit a casting produced from these patterns to an oil lubricated locomotive the only change would be some minor changes to the machining. Work has now started on the large hornblock for the centre driving axle. 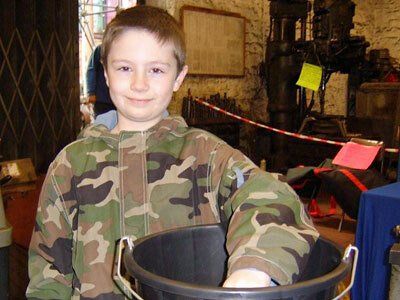 The draw for our Spring raffle took place at Bridgnorth on Sunday 29th March 2009. Nine year old William Pedersen was in the right place at the right time and was enlisted to draw the winning tickets, we are most grateful to him. His father looked on anxiously as he had just bought some tickets and hoped young William would pull out a footplate ride for him. Alas it was not to be and our winners are listed here. Congratulations to them all and thank you to everyone who gave their support. Winners were:- J Shaw , T Roberts, K Smith, A Pratt, Mr. Ditchburn, D J Porter, Miss Scott, Mrs Trend, Mr. Richardson, K Oultram, D Howett, Mrs O`Dwyer, Mr Perkins, and G Jones. The completed pattern and core boxes for the Firebox Support Bracket for 82045. This also forms a substantial stretcher and hence is needed fairly early in the locomotive's construction. 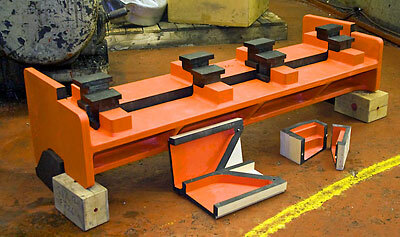 Machining of corner brackets; these buffer beam brackets are the first castings machined for 82045. This was the start of the patterns for the fore and hind horn pieces for the driven axles of 82045. The corresponding part yet to be made for the centre axle is made as a massive inverted 'U' shaped steel casting. 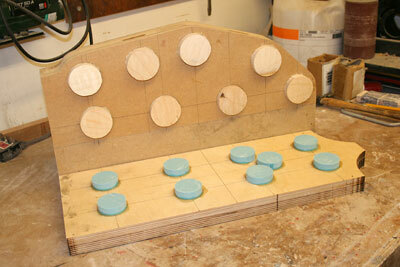 And a couple of weeks later and here are the finished horn guide patterns and core boxes! Young William Pedersen draws the winning tickets.